This is my conception of an English stir-fry. It is quick to prepare, but uses typically English flavours and ingredients. Rather than being served with rice, it is served with barley. The flavour combination, colours and textures work excellently. I was inspired by the sweetness of the free range pork produced by Boxgum Grazing, and thought it would pair so beautifully with the Blood Plum Finishing Vinegar produced by La Barre. It is a delicious, very healthy meal. Cook the barley in boiling water according to packet directions drain and keep warm. Chop the leaves and stems of the silverbeet. Heat the olive oil in a frying pan and add the pork and stems from the silverbeet. Cook on a high-medium, heat. When the pork is nearly cooked, add the silverbeet leaves and vinegar. Cook till the greens are wilted. 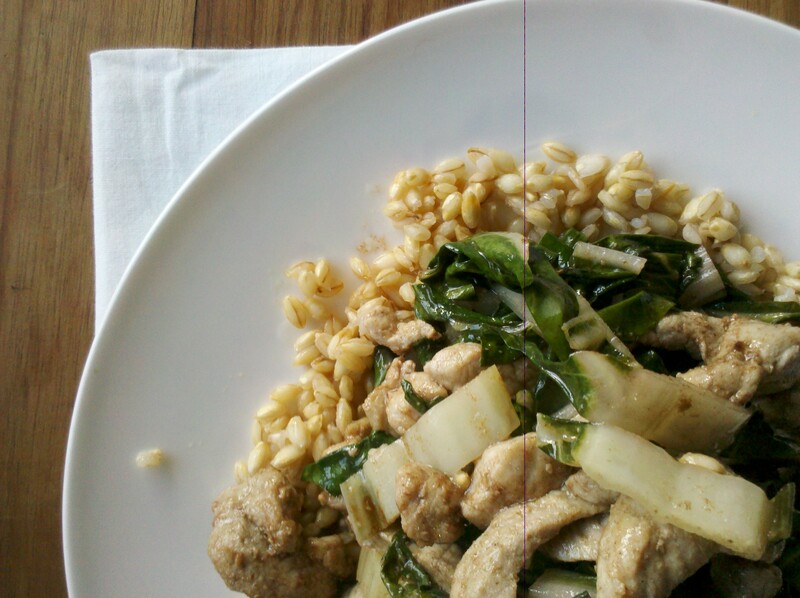 This entry was posted in Dinner, Lunch and tagged British food, pork, wholegrains. Bookmark the permalink.